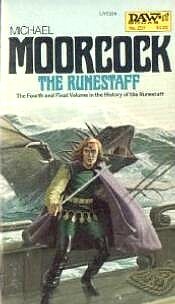 The Runestaff is the fast-paced conclusion to Michael Moorcock's four-part series "The History of the Runestaff" featuring Dorian Hawkmoon. Impatient of the Warrior in Jet and Gold's insistence that he follow the directions of the Runestaff, Hawkmoon sets sail for the Kamarg rather than go to the city of Dnark. Yet the Runestaff has ways of making him do its will and before they know it, Hawkmoon and D'Averc are escorted to the city by Orlando Fank, another outlandish servant of that artifact. Not even in Amarekh can they escape the armies of the Dark Empire, for the infamous Shenegar Trott has also appeared in Dnark, determined to make the Runestaff the empire's. The heroic pair must fight the Dark Empire for possession of the Runestaff. With the aid of Jehamia Cohnahlias (the self-styled spirit of the Runestaff) and miscellaneous servants of the Runestaff, the heroes not only prevail but are returned to their familiar Europe. Unlike previous volumes, Yisselda and Flana (King Huon's only relative, D'Averc's love, and Baron Meliadus's would-be usurper) rather suddenly become important characters. Yisselda in particular suddenly gains skills and a personality, all to the benefit of the series. The story lines all come together for a titanic climax. Meliadus's plotting against King-Emperor Huon and against Castle Brass bring dramatic successes. Hawkmoon must lead the rebels against the Dark Empire in a final battle with the help of the Runestaff and the Red Amulet�a final battle that will determine the future of the world. In true Moorcock fashion, he does not spare his heroes from the slaughter. Again, for fans of the sub-genre only, I rate it an 8 out of 10.